Blair Thornburgh is a former child who writes books for kids and teens with a sense of humor. Her hobbies include forgetting the lyrics to songs, deep dives into obscure corners of Wikipedia, and snacks. She was inspired to write her debut novel, the YA romantic comedy Who’s That Girl, after, among other things, listening to too much pretentious indie rock, spending a weekend yurt-camping in Quebec, and fighting a killer craving for a pumpkin-chocolate-chip cookie. A graduate of Hamline University's MFA program in Writing for Children and Young Adults, she lives in Downingtown, PA, where she is married to the mayor (no, really). 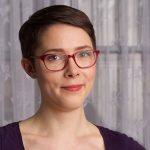 Clever Title Here*: How I Went from Awkward Teen to Published Author (ages 11 and up): This presentation is an overview of both my personal journey from, well, awkward teen to published author as well as a how-to and behind-the-scenes look at the drafting, revising, submission, and publishing process. It's my go-to presentation for schools and libraries that covers all the basics. Includes PowerPoint. *This is really what it's called. All becomes apparent in the presentation. Funny Because It's True: How to Turn Your Life into Humor (ages 14 and up): This presentation digs a little deeper into the craft of writing and shows teens how they can use the events, characters, and mishaps of their lives to write funny and powerful fiction. Includes plenty of hilarious anecdotes from my own adolescence. Includes PowerPoint. Small Workshop Intensive (ages 11 and up): This presentation/activity is designed for small groups (I suggest 8–10 kids). We'll work together on some brainstorming and story creation exercises, and work through some collaborations to show how language choice can create voice even when the bones of the story are the same. Does not require A/V; includes paper handouts.